* Double layers is designed to absorb sweat effectively even in hot days, which helps you feel good when doing sports. * Fifteen beautiful colors for your choices. What is more, the color stays bright after times of washing. * Comfortable to wear and be of durability, it would work for a long term indeed. * Completely blank without any logo on it. 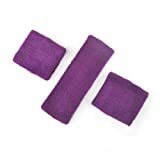 ** The price is for one set — 1 headband + 2 wristbands in solid color. This entry was posted in Tennis and tagged Color, GOGO, Headband, Solid, Sweatband, Thick, Wristbands by FPSports. Bookmark the permalink.